Just a few minutes’ drive from the outskirts of Berlin you will find the inviting, modern and cosy Plaza Inn Ludwigsfelde Berlin Süd. a friendly team for your leisure or business trip. 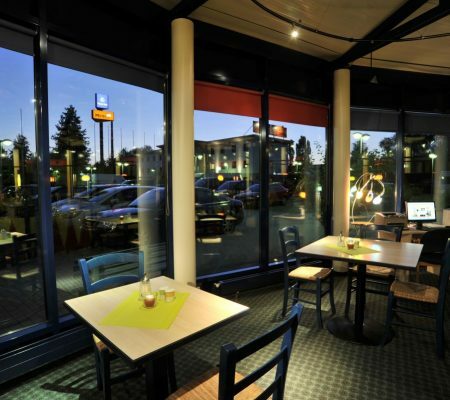 The Plaza Inn Ludwigsfelde Berlin Süd is located close to the A10 Highway, right in the “Brandenburg Business Park,” where numerous large international companies operate. Only 15 minutes away from the hotel you will find the new Berlin Brandenburg Airport which gives you the perfect overnight between flights. Our leisure guests enjoy access to Golf parks, beautiful nature paths and even the Kristal Therme SPA center that is just a few minutes’ drive. The quaint town of Potsdam is 25 minutes away, with its marvels Sanssouci palace, and the Babelsberg film studios, the oldest large-scale studio in the world. 40 minutes away is the Tropical Island attraction, a true tropical paradise with its aquatic center, forest, indoor river and sandy beaches. The hotel owns its own parking lot, suitable also for Trucks and Busses. Throughout the hotel you may enjoy our free Wi-Fi – in your room or at our restaurant – our Wi-Fi is ready for you. No machines, just friendly staff 24 hours a day, 365 days a year, our reception is open for you! Don’t leave your pet behind! Bring your dog, cat or fish to stay with you for a fee of 5€ per day. Free “SKY SPORT” at our Bar! Don’t miss any important game – sit comfortably and watch all games with food and drinks served 24 hours a day. As our guest, we are happy to give you access to our Business Corner equipped with a computer and printer free for you to use.